Ever feel like it would be great if you could make alternate versions of yourself so you could fulfill all you have promised on schedule and also commit to some amazing opportunities offered to you on top? I seem to be having the same issues, as many in crypto before me. The infrastructure is not yet ready for the scale that happened nearly overnight. I used to huff and puff at others like Coinbase right? This article about how most things in Vegas, this time, won’t (mostly) stay in Vegas. 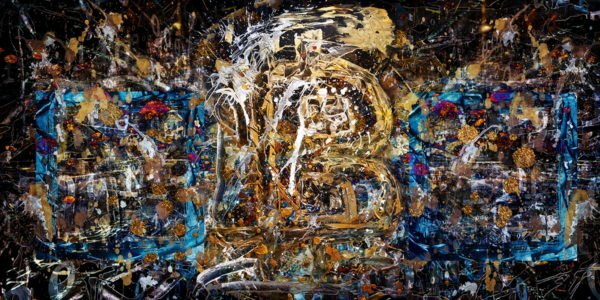 I was not even out of jetlag landing back to London as my alarm went off 4 AM to fly to Milan to meet a mediator for a large collector. All good problems to have – temporarily. Some of the popular pieces like “Fork & Flip“, as re-paint editions of three, are already all gone. The Lakshmi and Ganesh only have one more left. 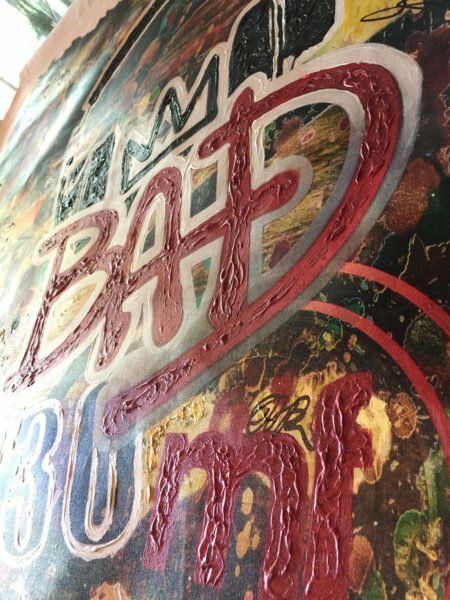 The unique metallic emulsion & digital prints remain as different formats with most. I suspect, not available for long either. 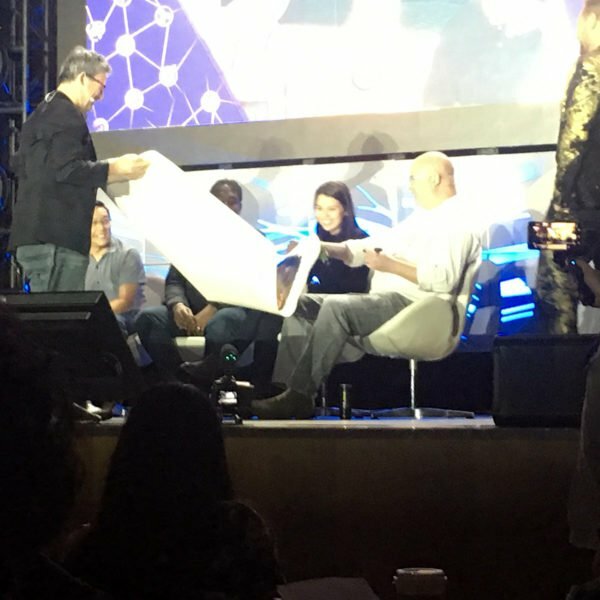 The World Crypto Con stage performance & keynote with Allyson Wilcox was the best I’ve done thus far. I felt relaxed, confident about the substance and had inspiring new things to share. Despite getting a blob of gold paint on the monitor screen it went well. Luckily it washes off with water but I’m sure the tech guys weren’t singing my praises at the end of the day. 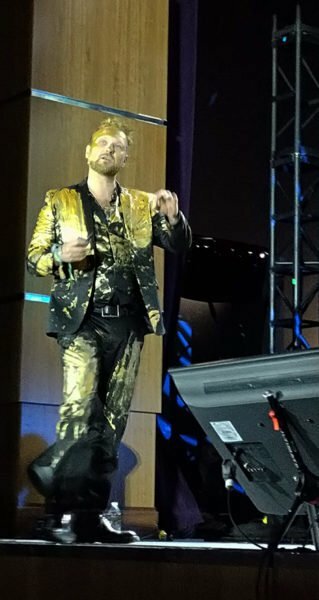 The performance also allowed me to walk and party the rest of the conference with a golden glow. As I wait for the full keynote recording to become available here are some clips being interviewed and featured by the good people of Nakamoto Jedi. 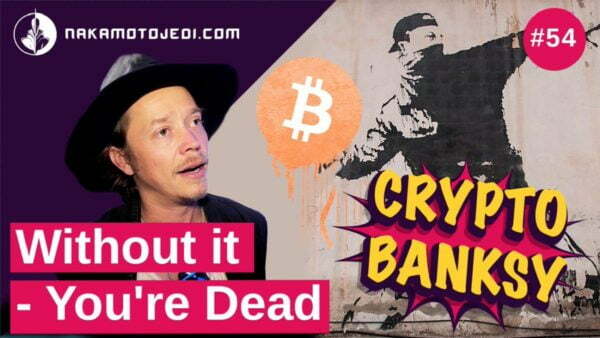 The feature image confuses me with Crypto Banksy for some reason but it’s alright guys. It was a busy week for us all 😉 Regardless, the “Without it you are dead’ line is something I very much stand behind. Creativity is no longer optional. It is compulsory for those who want to survive long term. This Futurism article proves the point. It was cool to meet many crypto legends at the sky villa of the Aria hotel where I was able to set up “It Used To Be Wired” for people to see. The price, for now, remains for private inquiry only. 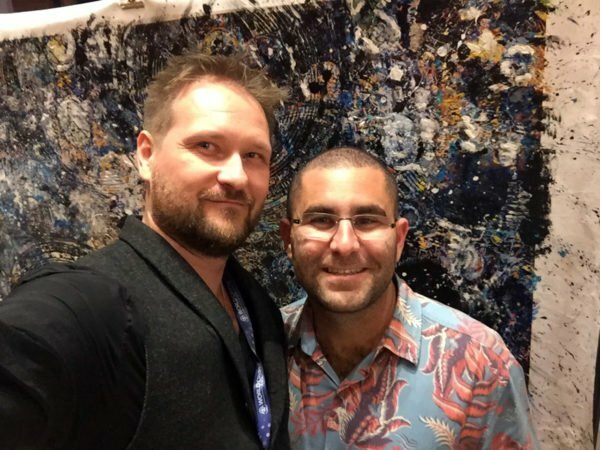 Some of the highlights were Brock Pierce and Charlie Shrem – as Charlie’s story specifically relates to the piece. As the sky villa was many times the size of the house I now live in, in a hotel that charges 21$ for a small bottle of room service water, it was all obviously quite impressive. Thanks to my lady @reallifelioness (pic with Brock) for having my back all the way. 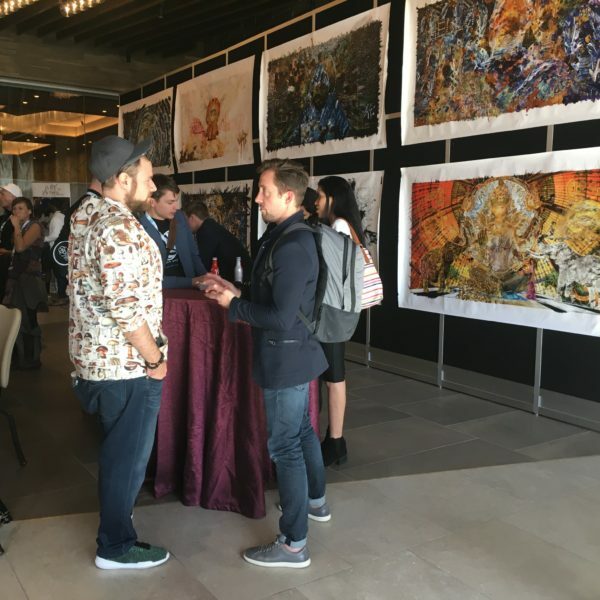 Earlier on, Charlie Lee of Litecoin and Dryan Doreian of PivX, swung by the wall of art to check out a few pieces and heard their stories. 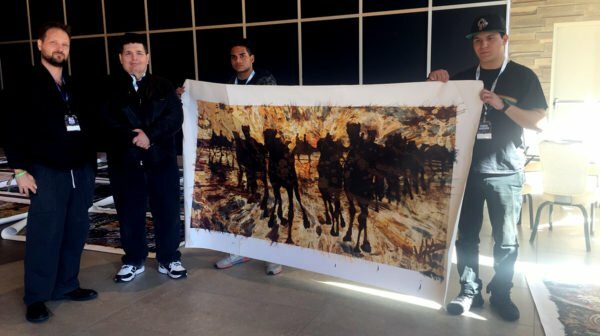 Bryan is here hanging out with my buddy Michael Jonsson, who collected a piece from me in Miami earlier this year. He brought the not-yet-out demo version of the RED 3D phone which was a hit all over. Another cool big art cat by the wall acquaintance soon a friend was Jan Kasparec. His story of getting immersed in blockchain is quite similar to mine and looking forward to learning more about his journey. You can check his paintings out here. These are civil faces before we planned the future a bit and started partying it up! The most visible charity hijack was the “Blood On The Podcast Floor” piece made about the Bad Crypto Podcast ep#130. 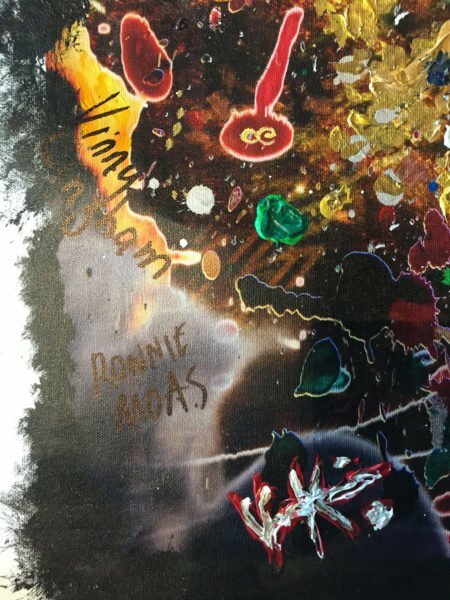 The unique piece got signed by Maxine Ryan, Ronnie Moas, Vinnie Ligham, Charlie Lee, Joel Comm, and Travis Wright live on stage. 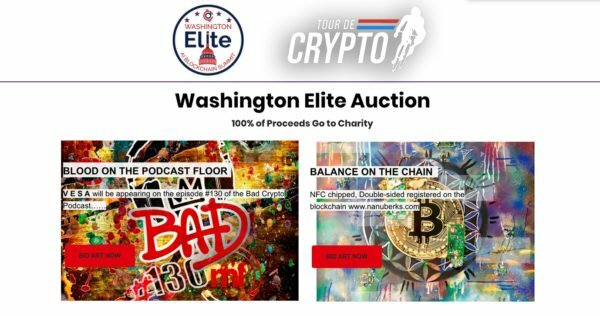 It will soon be auctioned at Washington Elite for Tour De Crypto and Hawctalk. Watch the refreshed story video of the piece here. What started as fun is now taking on true substance through helping to stop domestic & sexual violence and the crypto OG signatures. 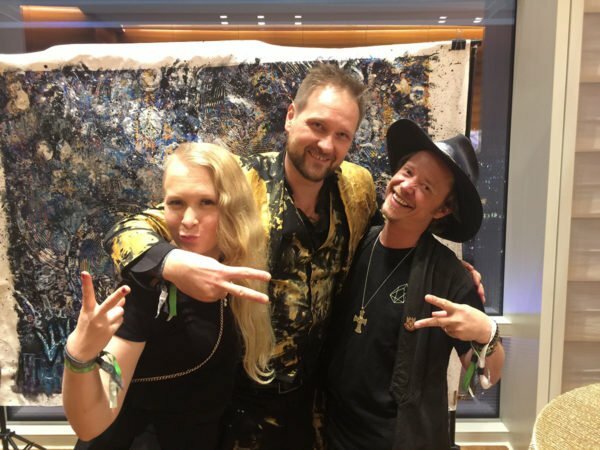 The crypto artist Nanu Berks has also kindly donated a unique piece called “Balance On The Chain.” She was ‘there first’ as I had no idea when donating the piece through Adam Williams, that there was already another artist involved. She has graciously shared the space in a good spirit. 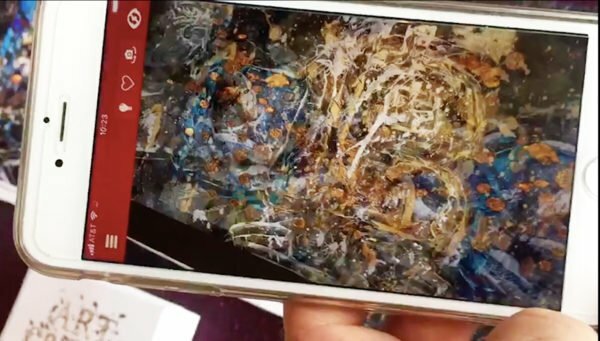 This is the video story behind her piece. 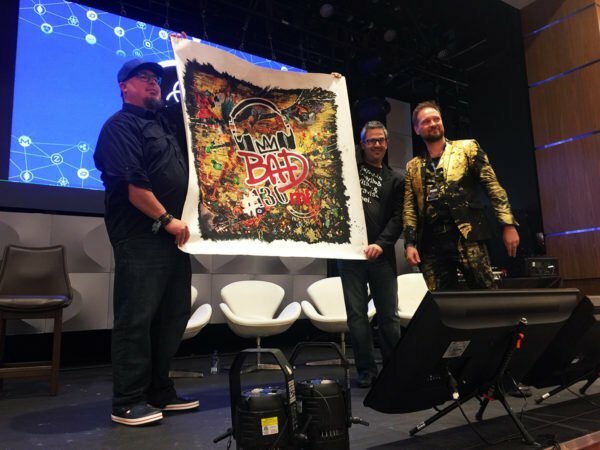 The founder of the conference Mr. Bruce Porter Jr and the mastermind Blake Rizzo unveil the Bad Crypto piece in its full glory for the first time on this video. The cause of Tour De Crypto was also amped up through Jason, the other cyclist, getting into a serious accident along the way. 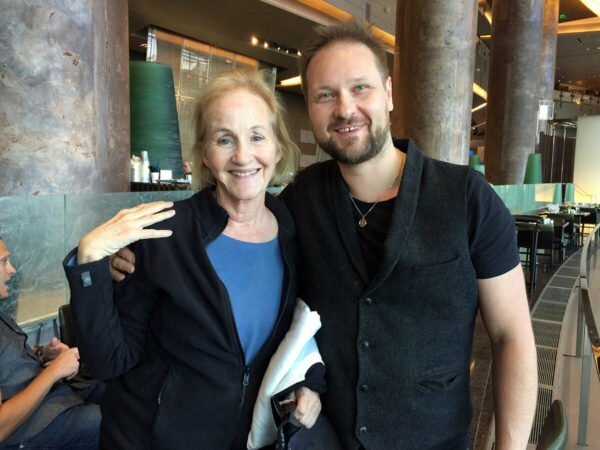 Thanks for the powerhouse that is Robin deLisser for instigating the signing process. She is putting together a gathering in Miami soon so perhaps keep updated via her LinkedIn. See the auction page direct here. 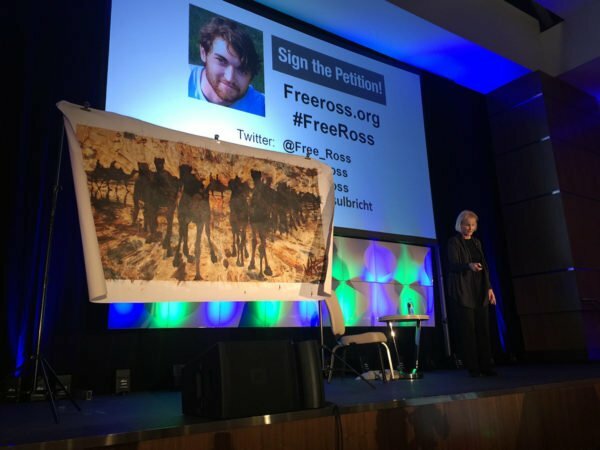 The second charity highlight was to get to present “Silk Road” and it’s auction 50% donating to the #freeross cause from all editions with Lyn Ulbricht. This includes the auction piece, further two re-paints, diasec and digital to complete all for sale versions. Her story and all that has transpired thus far with Ross is deeply moving. The personal letter she read from Ross from prison brings home many important points to re-open the case. Even if you think he should be punished for what he did, knowing some of the details underneath the surface, you have to agree the ‘die in max security prison for non-violent crimes’ is not how a civilized society should operate. The art piece, when bought, ships with a personal thank you letter from Ross. The minimum bid also, despite the added letter, starts from less than the list price on my site. The guys helping out Lyn were great at bringing some people to the art wall. One of them was Curtis Green, also, from the Silk Road origin story. It was great to tie the art piece in a relevant way to the source of it all. As witnessed in the letter written by Ross, none of the characters have frozen in time. They have all learned, grown and accepted responsibility for their learning curve. Silk Road to me, is a meditation about the responsibility we all have with increased power. The reflection is not only for the government but for everyone involved in this space. Silk Road is about having a vision for your life. How to run with power but cause no deliberate harm – in order to become our best selves. Many thanks for Lyn for her continuous courage and involving me. I hope to play a small part in the collective effort in bringing her family back together. 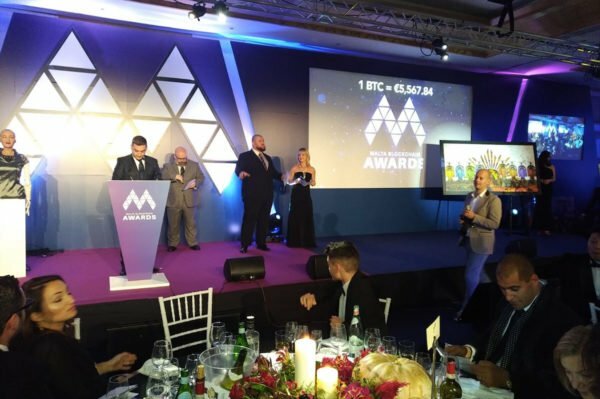 To complete the “holy trinity auction” was at the Blockchain Awards at the Malta Blockchain Summit. The guest of honor was the Maltese president H.E. Marie-Louise Coleiro Preca and the piece “The Magnificent Eight” got to share the stage with the A.I lady Sophia. To her, I want to say:” I like you. Please don’t kill us all when you get online properly. There is more to us than what appears to be the case at first glance.” – perhaps A.I soon will soon help with some of the initially mentioned “multiple selves” – challenges. Much better than total annihilation. 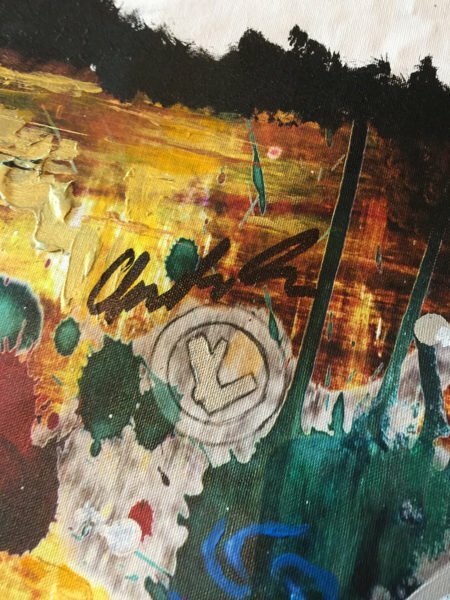 A very cool thing, amidst all this, was to be the very first to get my own signature instead of a blockchain code, with Codex Protocol. The Blood On the Podcast Floor piece was the first to be authenticated this way, which adds to the legend. Codex will now be the main provenance provider for my works on both my platforms. I’ll soon be adding the digital versions for sale there as well. Reservations can already be made and the prices average $50.000US. 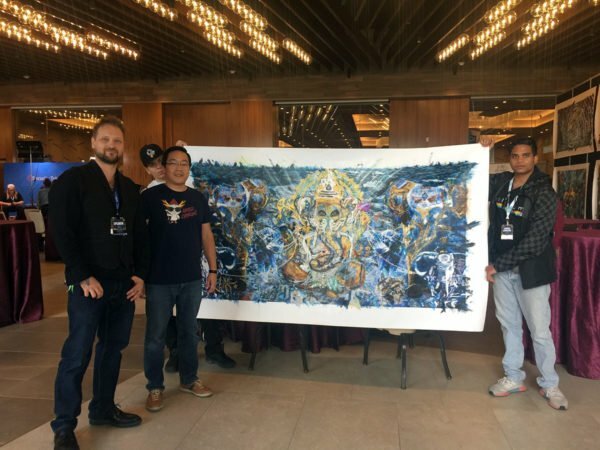 It felt like The World Crypto Con truly opened the new wave of crypto. One that takes creativity and experiences as seriously as they need to be taken for the next level of mass adoption. The next one will be even more incredible put up by Evolv starting from Monaco, The Hodl Rally and eventually the next Vegas event. 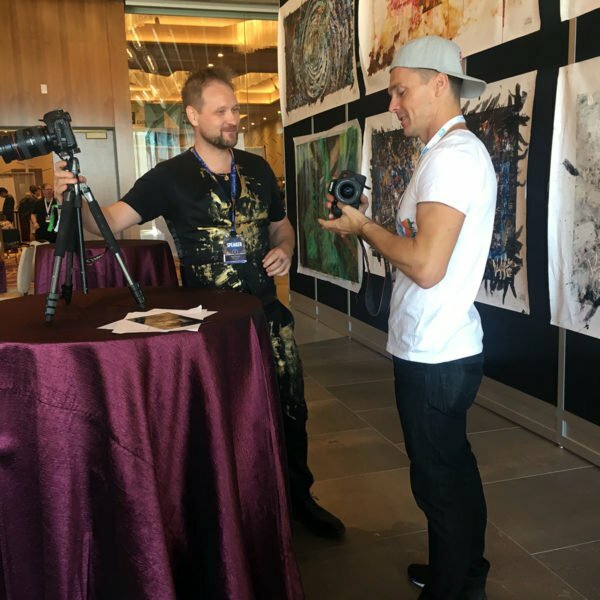 There is much more to tell but I suspect you are already stretched for patience to read about the awesomeness that was the birth of the creative blockchain conference. Adam Williams, Eric Spire, Dominic Hrabe, Thomas Shivers and Chris Herghelegiu – I applaud you all for having to guts, will, vision and resources to pull off a world-class event with a new premise. 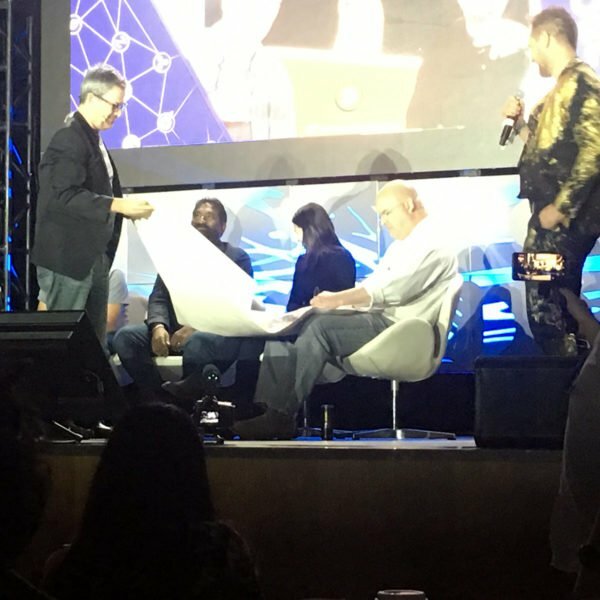 You opened up a new paradigm on what a blockchain conference can and should be offering. 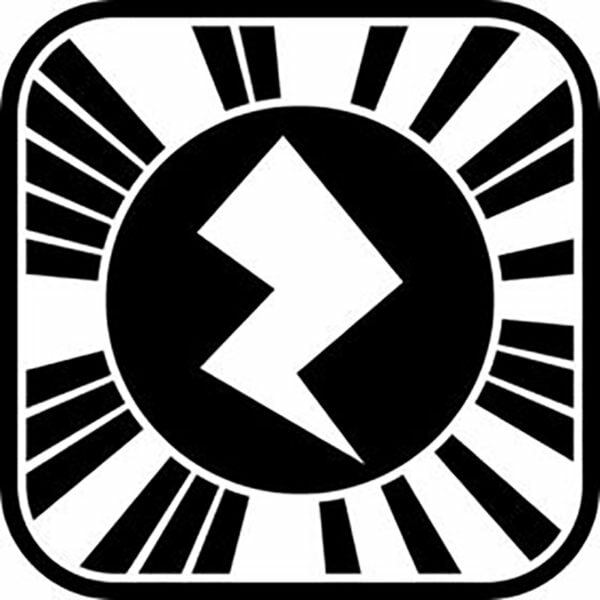 By downloading Zappar, scanning first the icon and then pointing your device to the piece – you will see what we did including a soundtrack. There is now no recovery time, despite it being literally sorely needed, but at least I get to mend the mental Vegas and Milan diet. In all other ways, I was already more than nourished beyond expectations. Soon flying back to Milan so more on that in the next article. 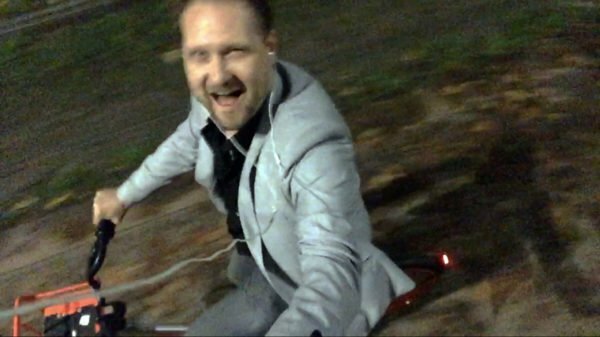 That’s just a random image of me bicycling in Milan almost right after first landing back in London. I can’t really reveal the details of the trip yet but can say the pizza was as exquisite as the reputation proceeds and people dress the best in the world.